If you remove the company's net cash position of $33 billion from its market cap, the current P/E (based on the company's last 12 months of earnings) is about 9. Despite efforts at product proliferation and diversification, Microsoft still makes most of its money from two main products, its Windows operating system and its Office family of applications. The stock's low P/E tells you that investors are rather bearish on the combined future of these two products, as well as Microsoft's future position in potential growth areas such as tablets and mobile phones. On the Windows front, Microsoft continues to dominate share in PCs and maintain a healthy share in servers. But the use of tablet computers is expected to take a bite out of PC sales. Furthermore, continued market share gains by MacIntosh computers could be a threat to Windows' market share in the future. With respect to Office, Microsoft now competes with a very high profile player in Google. Some enterprises are moving or have moved to Google Docs, having shunned the high fees associated with Office. In other areas, Microsoft continues to profit from entertainment products/services such as the Xbox console and software, but these just barely make enough money to cover losses in the company's online division, as Microsoft is losing badly to Google in the area of online search. While all of the above-mentioned challenges represent threats to Microsoft's future profits, it is extremely difficult to predict the future. For example, even if Microsoft loses share in both Windows and Office, has no success in tablets or mobile phones (or any other new products for that matter), and continues to lose money online, Microsoft's share of growth in global PC sales may more than offset any profit declines. For example, Gartner estimates PC shipment growth next year of 15.9% (the vast majority of which will likely run Windows and Office), despite "growing user interest in media tablets such as the iPad". So while the future is extremely difficult to predict, Mr. Market is nevertheless making a bold prediction. 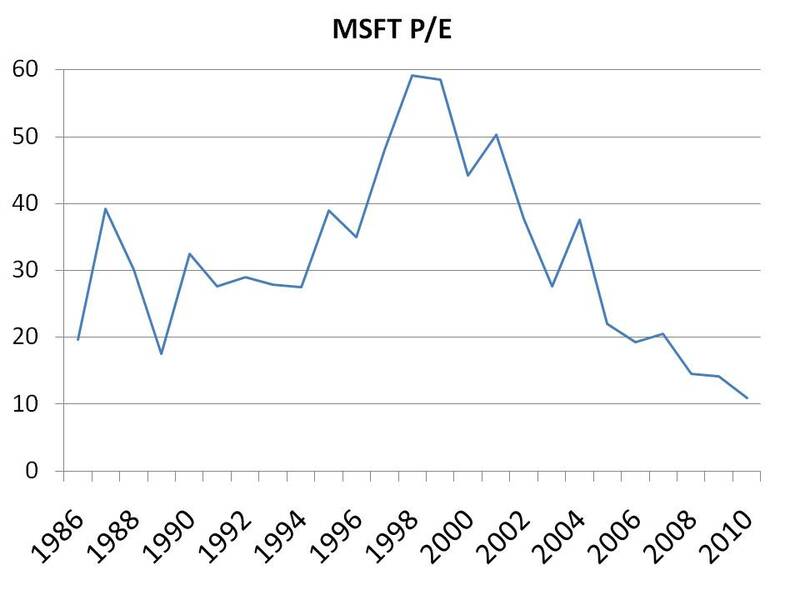 At a P/E of 9, he appears to believe that Microsoft's profits are in decline. This is in stark contrast to the company's latest quarter, which saw earnings growth in the high teens on an apples-to-apples comparison with last year. Like Cisco, which was discussed yesterday, Microsoft also returns a lot of money to shareholders in the form of buybacks. At the current P/E, further buybacks could turn out to be a terrific investment on behalf of shareholders. When Mr. Market boldly predicts a high-return company's decline, investors are offered an opportunity to buy an asset for cheap. In the case of Microsoft, investors are offered a company with a dominant position in a growing field, at the price of a company in decline. yo saj , gr8 2 see the way u r evolving , sumthing tells me u ll make a gud fund manager.its been almost an year since i discovered ur blog and it sure is becoming more awesum by the day . Ur willingness 2 stand apart from the crowd and most importantly , ACT RATIONALLY are wot makes this blog rock. Ur last few posts on cisco , microsoft and rim just go on to prove my point. (hopefully u've read The big short by now considering how much i've pestered u about it but then again u remind of Warren buffett said about walter schloss "...thats the good thing about walter, nobody has much influence on him")To quote michael burry "my job is to disagree and disagree very loudly with the market. Here are these stocks literally followed by tons of investors and everybodys busy imitating everybody. Barel - large cap tech continues to pop up on the radar. Wondering if you've taken a look at DELL, LXK or STX lately? On the theme of beat-up large cap techs with solid financials, I'd be curious what you think of something like HPQ? I don't own it but I've been tempted and torn because of its compelling metrics but managerial uncertainty and spending on acquisitions. I realize you probably get requests all the time, but if you even had an offhand comment to make I'd be interested. To your points, I tend to like these companies only if they have a competitive advantage that I can understand. If what they do can make abnormal profits in the short-term, but in the long-term can just be copied by the competition, then I'm not that interested. How do the companies you suggest fare on that scale, in your opinions? Hi Saj, i share your views about MSFT . trailing PE of 9 is extremely cheap for this company, given US is comming out a recession and computer use in emerging market is growing rappidly.. Also, MSFT is trying to be a player in the Cloud Computing world (not sure how big of a market this would be for MSFT)..
Mr.Market for now is chasing small/midcap high growth companies and is ignoring large caps.. I own MSFT shares too. My main thesis: network effect is really hard to break, e.g. "I am using Office because I need my client/friend/mother who has Office to be able to open my file without fail." In effect, the goose will keep laying the eggs. Saj, your analysis of Microsoft and RIM seems to be applicable to Apple in some respects, particularly given its recent share price decline from $700 to $500, an impressive ROE track record over the last 10 years, ~$120B in cash & marketable securities, a 2% dividend, alongside minimal goodwill on its b/s ~1B and a history of minimal acquisition activity. Could a company this big qualify as a value stock if there is enough herding behaviour and pessimism about its prospects? 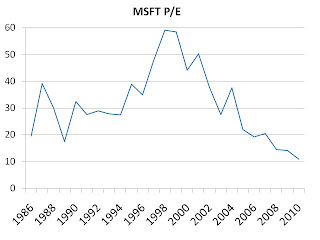 Microsoft, for example, has a trailing P/E of 14.7, slightly less impressive ROE track record, ~$70B in cash & marketable securities, fairly recent goodwill impairments of ~$6B, currently carrying ~$14.46B in goodwill, and a history of much higher and relatively less successful (indicated by recent impairment) acquisition activity.